The Weekly Inkling #216 over at Splitcoaststampers today is a tutorial on making these fantastic corner bookmarks. I paired up this new project with the Color Throwdown #99 using cream, chocolate & turquoise. I just finished crying my eyes out with the last book I read, The Last Song, by Nicholas Sparks...all of his books make me cry a river. My latest read, just started, is Nineteen Minutes by Jodi Piccoult...anybody read it? The Color Challenge #277 and the Sketch Challenge #287 over at Splitcoaststampers was the inspiration for my card today. The color challenge requires Crushed Curry, Bermuda Bay & Dusty Durango...the In Colors that are retiring TOMORROW! I can't believe it's already been a year since these beautiful colors were introduced to us. Good news, though...the new Cajun Craze reminds me of Dusty Durango, and Daffodil Delight will be a beautiful substitute for Crushed Curry. Are you ready for tomorrow? The waiting is finally over...the new 2010-2011 Idea Book & Catalog will be available to view online and to order from! I'm so excited:) The stamp set I used here, called Artistic Etchings, will also be available for purchase from the new catty...gorgeous! What a great deal! If you were a demonstrator at one time, but since have become inactive...now is your chance to rejoin at a great savings! If you are interested in receiving the great benefits that Stampin' Up! offers its demonstrators, I would be happy to give you more information on this great opportunity. The Rejoin Kit is not available online and paperwork must be mailed in for it. Send me an email (slschaf771@aol.com) or give me a call (217) 971-1321 and I'll give you the information you need to get you active again as an SU demo. 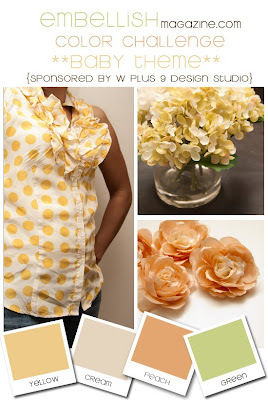 I paired up two challenges for my card today...the Embellish Babies Color Challenge using yellow, cream, peach & green, along with Mercy's Tuesday Sketch Challenge #80. 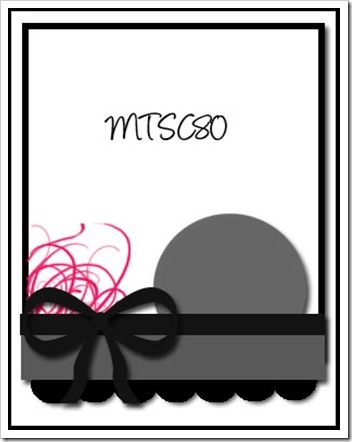 The layering of the card was done with alternating cardstock and designer paper. 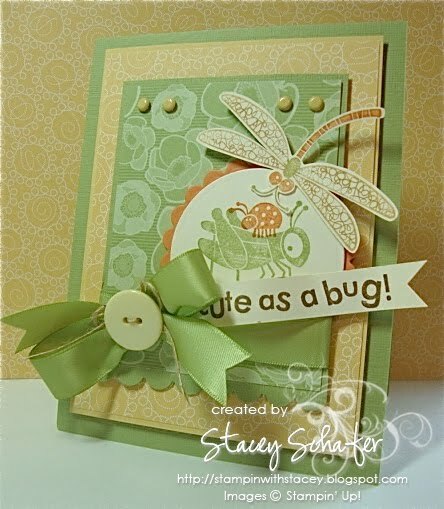 My stamp-a-majig came in handy with the stacked bugs and the sentiment. The dragonfly was stamped then handcut and adhered with a dimensional. What better way to use my new stamps and paper than to pair them up with the Taylored Expressions Sketch Challenge #118. Go check it out and play along! I stamped the flower and sentiment on the yellow checked paper, then the teapot with the rock 'n roll technique. 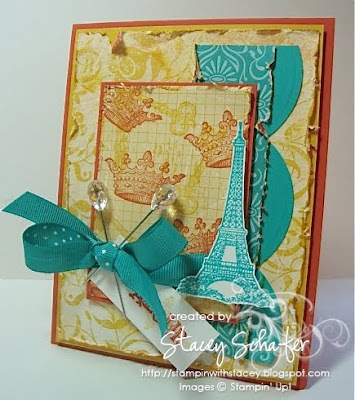 The cardstock was layered with the distressed paper and a few embellies were added to finish it off! 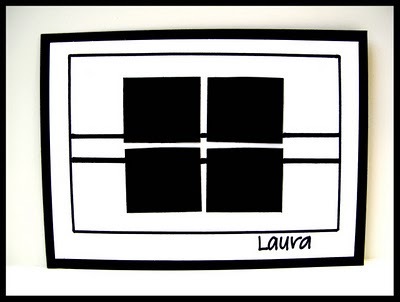 Mint Motiff is our sponsor for this Laura's Sketch #55 at 2 Sketches 4 You. 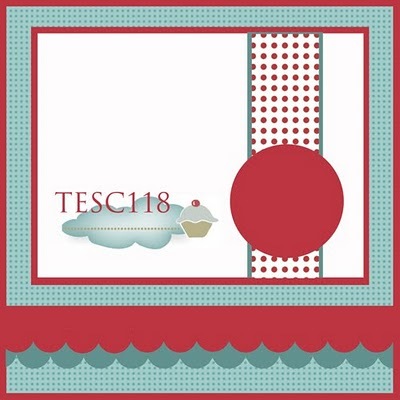 Head on over and see all the yummy samples from the design team. I used the Kaleidoscope DSP for my color inspiration on this one...gotta love pink, yellow and orange together...so summer! We took the kiddos on a last minute trip to Chicago for the weekend and I won't get the Curtain Call show stoppers or new challenge ready for you by midnight! My fabulous 'CREW' should have a few things to get you started, though, so go check them out! I'm so sorry for the delay and will totally make up for it with a little blog candy, so stop back by Sunday. I should be up and running by noon! By the way, have you noticed anything different about my blog face? Now we're off for a little Yorkville Waterpark and Lincoln Park Zoo fun! There is something else I LOVE besides cardstock, paper, ink, and embellishments...and that is wrapping paper! 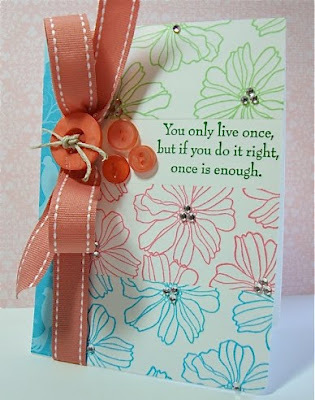 I have always enjoyed wrapping gifts for others adding fun ribbons and bows...yes, ribbons and bows, of course! When I saw these tubes of fun summery wrapping paper at the decor8blog, I thought to myself..."hmmm, Tempting Turquoise, Cameo Coral, Green Galore, Garden Green & Whisper White"...what a fantastic color inspiration for summer...totally tropical! 2. 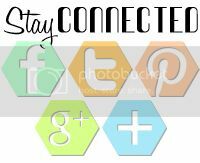 Post it on your blog or other public gallery (Splitcoaststampers, Paper Craft Planet, Stampin' Addicts, etc.) using the keywords Curtain Call 35 and make sure to include a link back here to the challenge. Please note the deadline will be Friday night. 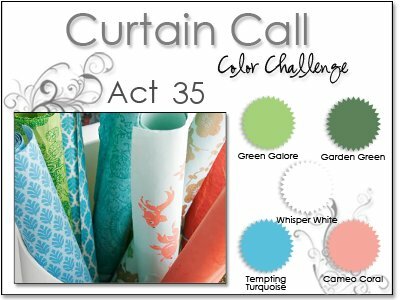 You have until Friday, June 25th before midnight (CST) to enter your Curtain Call Color Challenge: Act 35 project. 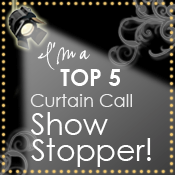 Join us for the Curtain Call Color Challenge: Act 35 and you could be one of the next Show Stoppers! We have two awards up for grabs plus a giveaway (details below)! 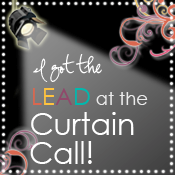 Those chosen as "The Lead" and "Top 5" will receive an award to post on their blog(s) and share the exciting news! The floral image from the Fifth Avenue Floral was inked up in Cameo Coral, Tempting Turquoise & Green Galore and placed on strips of Whisper White cardstock, the sentiment in Garden Green ink. The strips were adhered to the Whisper White card front with a strip of Flock Together DSP placed vertically on the side. The ribbon was wrapped and buttons/twine were attached to finish it off...but the real kicker is the sparkly rhinestones that were added to the flower centers. 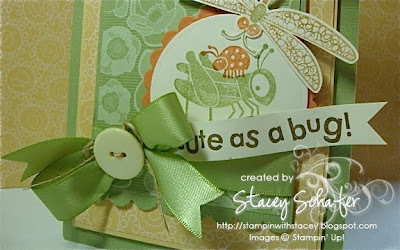 ...then play along with us and post your Curtain Call Color Challenge: Act 35 creation using Mr. Linky back here at Stacey's Stamping Stage. 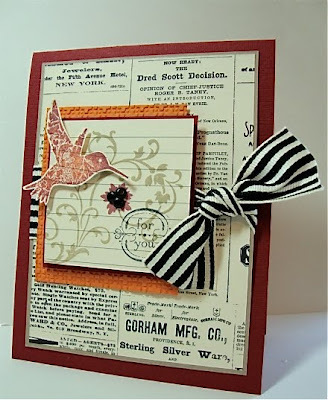 It's time for the Papertrey Ink Blog Hop! I used Aqua Mist & Lemon Tart card stock with Green Bouquet paper. The Aqua Mist card base was layered with Lemon Tart and Green Bouquet paper. The images from Springtime Doodles were stamped in Momento Tuxedo ink and colored in with Copics, then hand-cut and adhered with dimensionals. To finish it off, I scallop punched and embossed the Lemon Tart card stock, added a strip of Green Bouquet patterned paper and wrapped it up with some yummy Lemon Tart grosgrain with a Lemon Tart vintage button and button twine embellishement. How many times can you write Lemon Tart in a paragraph? LOL! I LOVE this color...so fresh and happy! 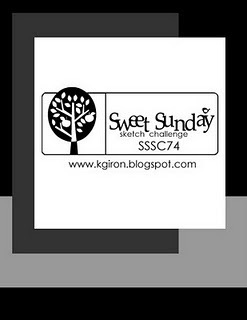 I used Karen's fantastic sketch #74 over at the sweetest thing for the layout of my swap card. The swap called for new products from the 2010-2011 Idea Book & Catalog. I chose to use some of the new Cherry Cobbler textured DSP & ink along with some yummy Newsprint DSP. The stamp set, Elements of Style and the Square Lattice Impressions Folder are currently available in the Summer Mini Catalog, but are carrying over in the new catty...yay!